Fruitless Pursuits: By George It's Metal! Luke brought up the game Bioshock: Infinite as one of the ones he was looking forward to when we were discussing the very few games that we had in our scopes for 2012. 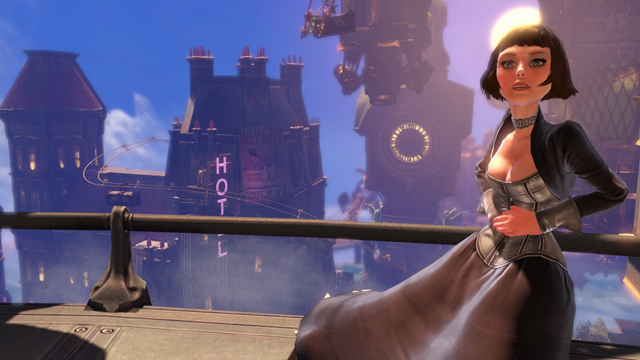 The Bioshock series has been a ton of fun for me, certainly, and I may be one of the few people who actually liked Bioshock 2 more than the first game. Certainly, it looks by all accounts that all of us will be enjoying this newest installment in the series, come Fall, even though it has very little if nothing at all to do with Rapture. In essence, toweling off and soaring amidst the clouds looks like it might be fun. I hope they do eventually plan to return to Rapture someday however...I don't feel that the place has had its story completely told. Something does not feel...complete. This city in the clouds holds some promise though...I am a bit torn on this Motorized Patriot. I have not decided yet if I absolutely love it or not.